PRNU-based forgery localization is not reliable in saturated areas (i.e., totally white or black regions of the image). 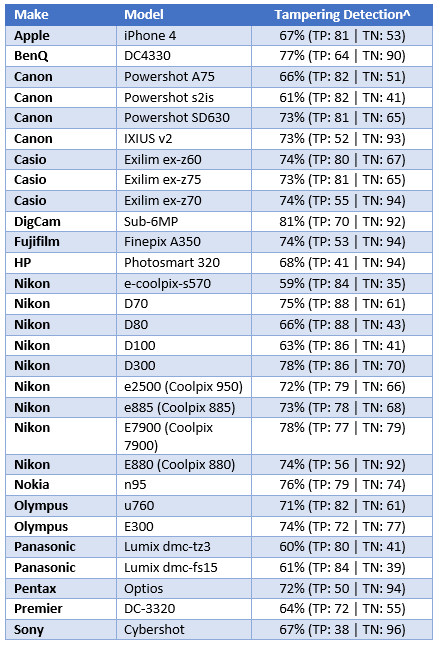 Indeed, for those pixels, it is impossible to discriminate between the image content and the actual sensor noise. 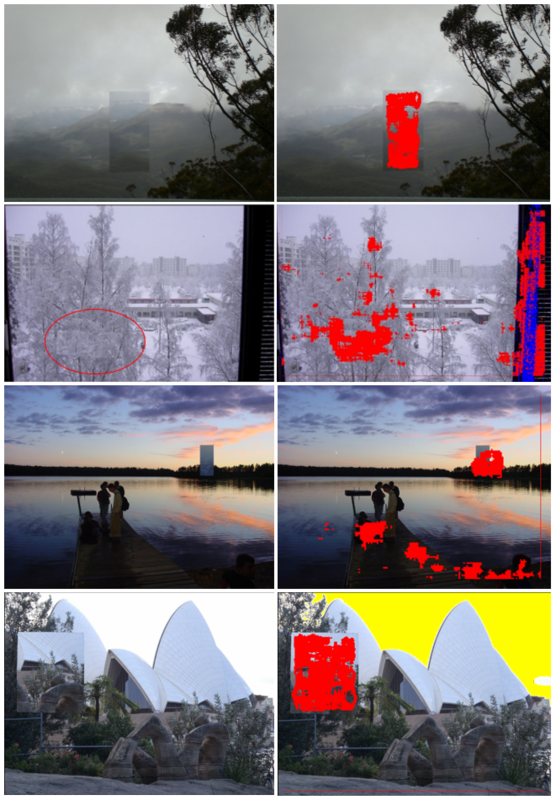 The new version of PRNU-based forgery localization enables highlighting of white and black saturated pixels (marked in yellow and blue, respectively), in order to help the analyst rule out false alarms. The forgery localization algorithm has been tested using images from the Base dataset we described in a recent post (29 devices, 10,000+ images). For each device, 15 images were randomly selected and, for each image, a copy-move tampering operation was performed. This means that a randomly positioned region of varying size was selected, rotated/resized and copied to another location of the same image. After pasting pixels, the image was JPEG compressed. Parameters regulating the forgery operations and final compression are as in Table 4. Some examples of forged images and corresponding forgery localization maps are shown below. It is evident that false alarms are the main problem with PRNU-based forgery localization. Indeed, it is highly probable that manipulated pixels do not correlate with the sensor pattern; unfortunately, it is not as probable that untouched pixels will correlate sufficiently with the pattern, thus leading to false alarms. In particular, saturated and very dark regions are more prone to raise false alarms. For this reason, the output map highlights dark regions in blue and saturated regions in yellow. The list of performance per device is given in Table 5 below. On average, the overall pixel accuracy is 70.4%, meaning that 7 pixels out of 10 are correctly marked as authentic or forged. Taking a closer look, we also observe that, in general, the True Positive rate (correctly detecting manipulated pixels, denoted by TP in parenthesis) reaches higher values compared to the True Negative rate (correctly marking untouched pixels as authentic, denoted by TN). This is expected, as yielding high values for TN requires a good local sensor noise match throughout the whole image, which is difficult to obtain in case dark or strongly textured regions are present (see the figures on the second and third rows above for an example). Finally, the fact that the TP rate never reaches 90% should not be worrying too much: most missed pixels are those laying on the edge of the tampered region, which are not detected because in the block-based analysis they share the same block with neighboring authentic pixels (see top and bottom figures above). Overall, we can definitely say the new PRNU Tampering Detection filter is a powerful forgery localization tool, provided that: a) you have enough images from the camera to build a reliable reference pattern, and b) you keep in mind that, being a multiplicative noise, PRNU will be less reliable on dark regions.